Amara was still shaking. The village juju-man, Opowkri, was baffled by the blatant refusal of the evil spirits to bow to his incantations. Did the spirits aim to ridicule him? And in front of the entire village?! Well, he was having none of that! He cast a furtive glance at her parents who were huddled in the corner and quickly turned his attention to the shivering girl lying on the thatched mat in his dimly lit mud hut. The room was smoky from the tiny calabash filled with dry, burning herbs and he had to refrain from coughing as the smoke choked him. He was, after all, the intermediary between the gods and the people. He took the white speckled fowl he had asked her parents to bring and raised it to the sky. He implored the gods of hale and hearty health to prove the uninvited spirits wrong; to show he was stronger than these spirits. The fowl cackled, seeming to know that its end was near. Its loud crows were nothing compared to the cacophony Opowkri was making. He finished his incantations and in one fell swoop, pulled out the head of the fowl from its neck. Blood spurted everywhere. He quickly directed the spurts towards the naked body of the girl. In normal times, her parents would never have allowed their daughter to be naked in front of a man but these were not normal times. He had insisted that they removed her clothes so he could work his voodoo. And as expected, they quickly obliged. She was their last surviving child; having watched six of their children die in the last three months. They didn't want to lose her and at that point, they would have done just about anything. Opowkri rubbed the blood all over Amara's body, pausing ever so slightly on her breasts and trying his best to hide his arousal. As his hands traipsed over her body, he muttered incantations that were only understood by him and the gods. The fetid smell of fresh blood mixed with smoke from the burning herbs was enough to make anyone retch; and that was what he was going for. On cue, Amara raised herself up and retched, only managing to miss hitting him by a few inches. 'Yes! Get out of her you evil spirit! Get out of her! Remove him from your body my child!' And he went into more incantations. He started dancing around Amara, chanting, beguiling and asking the gods to show them strong. 'Wa....wa...I ne...eed wat...ter.' Amara croaked. The juju-man paused in his dance and shouts and watched her for a second. Her parents scrambled to give her the calabash filled with dirty stream water. Her parents retreated to their corner of the hut and held each other. The 'dance-cantations' continued for two hours; two hours where Amara progressively got weaker, threw up five more times and croaked for water over and over again. The filth was not cleaned up nor was her thirst quenched. The smell in the room was worse than the village outhouse at the edge of the forest. The last time Amara vomited, she didn't even have the strength to raise herself up. She just threw up and gargled in her own vomit. After that, she stopped shaking. She was no longer hyperventilating or as Opowkri came to find out, breathing. Her parents started screaming. 'Get out!' The juju-man shouted so loud, her parents fled the hut. That didn't stop the whimpers of her mother from filtering into the silence of the hut. He checked Amara and saw she was perfectly still. Her skin was losing the hotness that it had a few minutes ago. For the first time since she had been brought to him three nights ago, she looked peaceful, finally at rest. He didn't need a fancy white cloth and a rope around his neck like that missionary medicine man in the village square to know that Amara was dead. This was the twelfth child he had seen die in the last two moons; and all of them in his tiny hut. He had told the parents that the gods were punishing them for taking the little drops of evil liquid from the missionary medicine man. The evil man had invoked the anger of the gods when he said the gods were non-existent. He had gone further to say that diseases were not from the gods to punish them but as a result of their dirty environment. He said he had a thing that could prevent diseases and that was when he convinced some parents to take those little drops of his own type of voodoo. It didn't matter that every child who wasn't sick before they had taken the city man’s evil medicine was still hale and hearty. It didn't matter that the families who had made certain lifestyle changes like weeding the grass in front of their houses, boiling and filtering their water and using his fish net to sleep were healthier than those who didn't. It also didn't matter that the man had insisted that Amara was suffering from the disease of the mosquito and dirty water and that he had something he called 'drugs' for them. What mattered was that he wasn't going to allow any other medicine man take his place in this village. His father had been the village juju-man as had his father before him. He was definitely not going to allow a twit from the city come up and outwit him. His mind made up, he got up from his kneeling position in front of Amara and wiped some vomit off his knee, unaffected by either the smell or the grossness. He turned to the door...and walked out. The people gathered around him. He shook his head and in unison, the women of the village started wailing. The men nodded their head in sorrow. Amara was the most beautiful and supple girl in the village. Every man had wanted to win her for a wife. Now she was gone. Opowkri allowed them to mourn for a few minutes then raised his staff to demand their attention. 'People of Umalaku! The beautiful Amara has gone to join her ancestors!' More wails went up. 'Shut up women! Your tears will not bring her back!' The women toned down but didn't stop crying. The juju-man continued. 'Our land has been polluted by people who have disrespected our customs and traditions.’ He took a deep breath before pointing in the direction of the village square. 'That man from the foreign lands has brought in new gods, new customs and new traditions....and you!' he pointed slowly at everyone, 'you have allowed him to stay. He insulted our gods and no one was incensed! Now! Our children are dying!' The wails became louder and this time, the men joined in, muttering. 'The gods have decided! That man must die! And his family with him! Everything he has must be burnt to ashes!' The people were suddenly restive. They needed to blame someone for the deaths. A nervous energy seemed to have gripped them and it wasn't long before there was blood lust in their eyes. 'Then do the right thing! Now that you know what the gods so decide, what will you do?' With that final announcement, he turned away from the crowd and matched into his hut with the flourish of a man about to have his way. 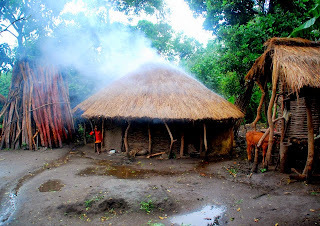 The men of Umalaku went their separate ways to get their machetes from their houses. From every direction came the men to the village square just in front of the house of the city medicine man. Other people moved away from the front of the house. In no time, the house was fully surrounded. The men chanted war cries; each man trying to outdo the other. Inside the house, Dr. Michael Obiekwe knelt with his family in prayers. It was an irony that he was to be killed for bringing modern medical techniques to hinter towns. He had helped saved lives by introducing ways to prevent and combat malaria and typhoid, a major killer in the villages of the rain forest in eastern Nigeria. He was not afraid of death; for he had given his life a long time ago to ensure others were well. He just prayed his wife and two beautiful daughters didn't suffer much when the time came. He was brought back to reality when Annabel, his youngest daughter, tugged his hand. 'We are waiting for you, Daddy.' she said with such innocence. 'Yes love.’ He eyes met his wife's whose pained expression was almost his undoing. She smiled shakily and that gave him courage. He pulled his family to himself and started.